The Lion's Mane is the largest known species of jellyfish in the world. Its range is confined to cold, boreal waters of the Arctic, northern Atlantic and northern Pacific Oceans. They are seldom found farther south than 42°N latitude. Similar jellyfish (which may be the same species) are known from the seas off Australia and New Zealand. Lion's Mane jellyfish-in spite of their name-are not fish, but invertebrates. They are relatives of sea anemones and corals. Jellies are 97 percent water. With no heart, no brain and no real eyes, jellyfish have three main parts: the round umbrella-like bodies or bells which propel the animals with a pumping or pulsating motion; tentacles that sting and immobilize prey using sting cells called nematocysts; and oral arms or flaps that are used to eat their prey. With this basic inventory, jellies manage to defend themselves from danger, make daily and seasonal journeys, stay together and occupy all the oceans of the world. Simple in design, fragile in build, jellies have few of the complex features many animals use to survive. In the Arctic certain specimens can reach up to 8 feet in diameter, small or average ones ones may exceed 36 inches in diameter. With its tentacles fully stretched, the Arctic Lion's Mane Jellyfish is probably the longest animal on Earth--longer than a 100-foot blue whale! 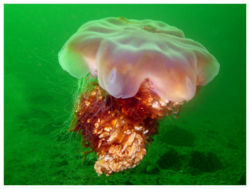 The bell of this jelly can be up to six feet across. The smallest Lion's Mane's measure only a quarter of an inch across. The life cycle is the same as all Jellyfish. During reproduction, the male releases sperm through its mouth into the water column. The sperm swims into the mouth of the female where fertilization occurs. Early embryonic development begins either inside the female or in brood pouches along the oral arms. Small swimming larvae (planula) leave the mouth or brood pouches and enter the water column. The larvae then seek a shaded surface and attach to a hard surface, forming polyps. These polyps bud and create huge polyp colonies, divide individually and bud into infant jellyfish (Ephyra). In a few weeks, an ephyra will grow into a fully adult medusa, thus completing the complex life cycle. Jellyfish (on average) live three to six months. This page was last modified on 16 August 2014, at 13:57.